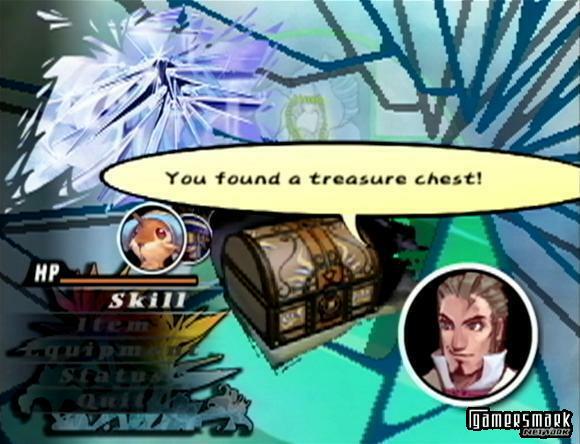 Unlimited SaGa is the latest in the underrated SaGa series. Let me tell you right now, you’re in for a big disappointment. This game seems like it’s an experimental mending of 3 games: SaGa Frontier 2, Legend of Mana, and Final Fantasy Tactics. The best way to explain each aspect is to put them in a numbered list. 1. The vastly different character choices and their journeys (from SaGa Frontier 2) is the basic formula for Unlimited Saga. Seems interesting right? Of course it is. That’s why I liked SaGa Frontier 2 so much (and still trying to beat it). 2. Remember the adventure stuff you always sent your allies on in Final Fantasy Tactics? Well, you get to do them now! Hooray! 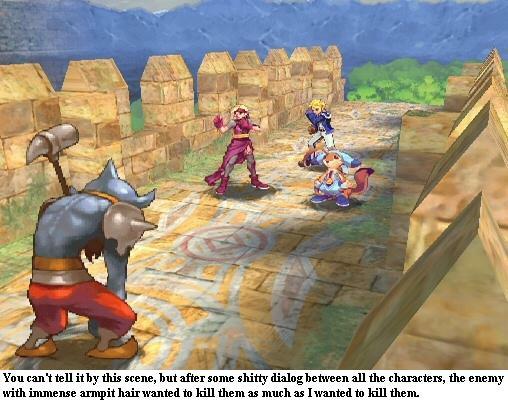 The only good thing it takes from Final Fantasy Tactics are those adventures, but the bad things it takes from it make this one good thing bad. This game also has the same basic towns, meaning they’re just pictures, and you don’t get to roam around. The whole game you don’t get to roam around at all. There’s no actual moving of a character in a conventional sense, like in any regular Final Fantasy (or really any) game. You hop around like it’s a board game. This is sort of like FFT, in that you just tell the person where to go and they go, and you don’t actually move them. 3. 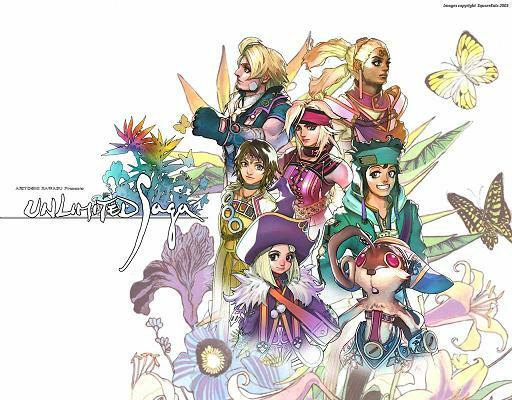 Most have probably not played Legend of Mana, but it was a pretty fun game. Unlimited Saga takes from this game the kind of towns there are, meaning the different places you can choose to go to in the city itself, but then mixed with the FFT towns. You don’t actually move anywhere, you just select the place you want to go and a picture comes up for the place. Legend of Mana was just one big game of different adventures you had to do for people, sort of like this game. Now, take a game that mixes that interactivity you had in Legend of Mana for those missions (which you actually play), and the adventures you sent your allies on in FFT (which you didn’t play at all). You get something of a 50% interactivity game. That game is Unlimited SaGa. Oh, and you don’t get to see any of the places you’re traveling except for a little random picture in the top left corner. The people in the bars that you can converse with are about as dumb as the main characters are flat (and that’s pretty bad). I’ve only played one out of the 7 characters you can choose from so far for about an hour, and I can say that there are some interesting aspects to this game. However, after a while these “interesting” things don’t become so interesting anymore. The strongest point about this game is the graphics. Everything about this game graphic-wise is beautiful, because I actually really like hand-drawn-looking graphics. The only bad thing is, is that there is no animation except in battles, and the animations aren’t very good. Enemies look better than your characters actually do. Half the time you’re playing a board game, and the other half you’re battling. This gets kind of boring, because when there are some story scenes (which are rare) the only things that you see are the cut-outs of characters talking about stupid things. The music is good. It definitely sets a mood, depending on which adventure you’re in. But the game itself is not executed well, so the music becomes sort of useless to listen to because you don’t really even see what kind of a place you’re in. For example, there’s creepy music in an abandoned castle. But you don’t see this castle at all, so it takes away from the experience of enjoying the music. The gameplay is executed well FOR WHAT IT IS. In the beginning, I couldn’t figure out how to move my character across the board-game part of the game, until I accidentally hit my left analog stick. A weird circle thing popped up, and pointed towards the ????? box. OHHHH so that’s how you move. And the first time I saw my character move I was horrified to see that all it was, was a still black and white image of my character jumping around. “Isn’t that terribly fun?” you might ask. No, it isn’t. Now, you have to say, “The battle system is good, isn’t it? That’s what you come to expect of the SaGa series!” Yes that’s what you are expecting, but you are let down and then shot in the head like a lame horse in the backyard. The battle system makes no sense. Let me start at the beginning. Ok, you enter a battle. Like in other SaGa games, you have HP and LP. Your attacks actually use HP, and in no time you’re down to 0 HP. Supposedly, HP is a wall “protecting your LP.” But since HP is depleted so fast, I see no real reason why HP even exists in this game. Sometimes, when you even have HP, your LP is decreased for no real reason. When you lose all of your LP that character dies, and doesn’t come back till you go back to a town. There is also a “combo ’system’” (notice how I put system in double quotes, because this game really doesn’t have a system of anything). The combos are helpful, yet not helpful during battles. Moreover, it just doesn’t make sense. When you attack, you have 2 options. To either “Go!” or “Hold.” If you go, you just attack. 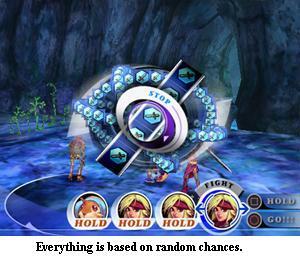 If you hold, then you get the chance to string together multiple attacks by your allies, or the one character. Yet, you also run the risk of having an enemy get into your combo and deal more damage to you than you did to him. That happens almost every time, and makes you not want to use combos at all. The whole battle system is a mess, and there is nothing really going for you. You can’t even heal your freaking health, LP, or get rid of status problems without going back to town. It’s confusing what actually happens in a battle. You won’t see yourself going to the main status menu very often anyway. It’s not like any of it is useful. This was a horrible execution of so many good ideas. This game would have been good, if it were more interactive, and if it were an actual GAME. This game is just a bunch of commands that you don’t have any fun in doing. The only thing you actually get to do is when a random spinning wheel comes up and you hope you succeed in what you’re trying to do. Unlimited SaGa isn’t a game I would suggest to anyone, not even to those who were fans of the previous games in the series. The game lacks interactivity and isn’t too appealing. Perhaps if you’re looking to waste some time, Unlimited SaGa would be worth looking in to, but it would be wise to search elsewhere. Ratchet and Clank are back for another go around, and from what I’ve seen in the past, it’s going to be one heck of a game. Ratchet and Clank is a 3D action game in which you control the characters Ratchet and Clank. Ratchet has at his disposal a vicious set of weaponry, ranging from flamethrowers to rockets to strong magnets. Clank assists Ratchet along the journey, and is most of the time on Ratchet’s back, occasionally becoming a helicopter, talking in a British accent when the story needs to be moved along, and more. Clank can also be used as his own independent character. The series seems to get better with each game. Already packed with enough weapons to raze a small country, the addition of more weapons will make for an even more action-filled experience than its predecessors. Also with an online mode included, this game will be an awesome experience. Ratchet and Clank: Up Your Arsenal is set to come out in Fall 2004.